This Open House Sign vinyl banner is the perfect way to attract attention to your open house event. Attach it to any vehicle in seconds and get your event noticed. 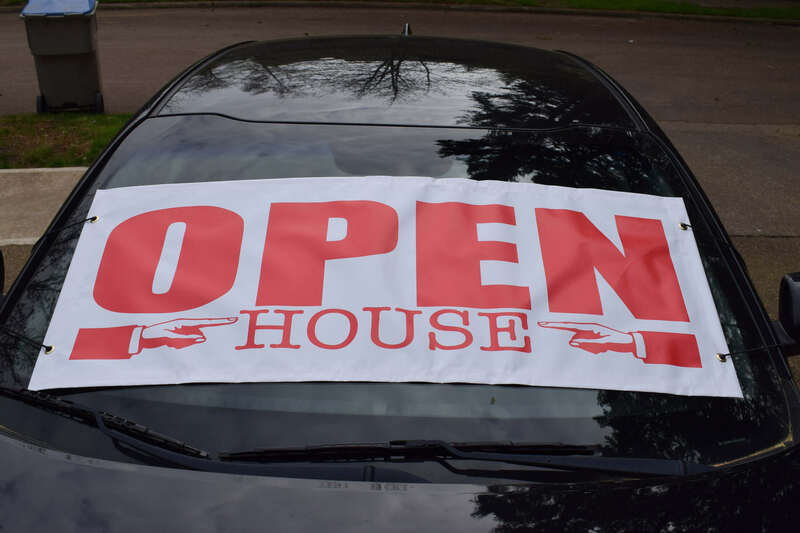 If you are holding an open house and you want to make sure as many people as possible come along, you need the Open House Windshield Banner. Simply attach it to your vehicle using the elastic straps, and it will instantly attract attention to your event to ensure no one misses out. What’s more, because this open house sign is made from high-quality waterproof vinyl, you can fix it up in any weather to ensure the rain does not spoil your big event. It only takes seconds to put up, and you can take it down just as easily. Use it multiple times to get more people to attend all of your open house events. If you want to make sure lots of people attend your open house, advertise your event properly by using this Open House Windshield Banner. In addition to this Open House Sign, we have a large range of windshield banners and open house signs to choose from, including Custom Windshield Banners, Garage Sale Banners, Custom Real Estate Flags, and Mini 3D Real Estate Flags. If you are based in the USA, we will make sure we get your order to you in no more than 5 days after you make your order.